Back in November I suffered a miscarriage. I wrote about the experience, but after I wrote about it, I didn’t delve further into what was happening with the recovery process. You may have noticed things got kind of quiet around here during that time. Posts dwindled to the point of near-non-existence. Things got a pretty “real” there for a while. Turns out what I was experiencing has a name: Postpartum Panic and Anxiety Disorder (or PPA). It’s the lesser known cousin of Postpartum Depression, but it has just as scary of a bite. Combine that with the tragic loss of a pregnancy, and I couldn’t keep it together long enough to cook a meal let alone write blog posts. Thankfully, I am on the road to recovery. I went through a period of using medications, lots of follow ups with my primary doctor and my OBGYN and I am still seeing a counselor to help with my grief. 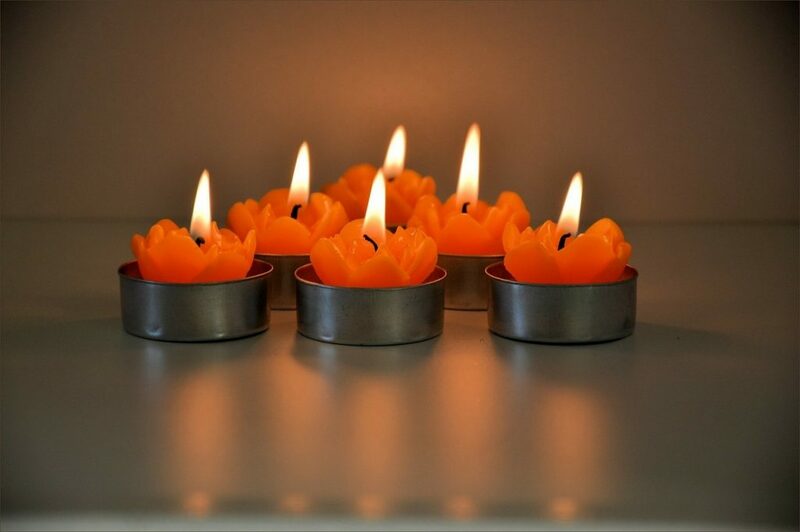 Throughout this journey I sought out ways to lessen the anxiety and panic that creeped up on me often out of nowhere. I wanted to share my tips for handling this anxiety naturally for anyone else who might be going through the same journey, or a similar one. 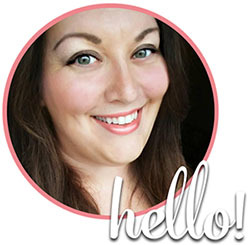 I realize medications are not the answer for everyone, and as I prepare my body to attempt pregnancy again, I know that I need to minimize any drugs in my system so I have begun turning to more natural alternatives and lifestyle adjustments. It’s important that your body be properly nourished, especially if you’ve recently experienced a traumatic event or loss. Its easy to lose your appetite, or start binging on unhealthy foods. While vitamins won’t replace a healthy diet, they will help make up some of the difference. I chose a comprehensive multi-vitamin made from natural ingredients. I also take a mega-dose of vitamin D. Make sure you are getting plenty of iron, magnesium and potassium as deficiencies in these minerals can cause heart palpitations. If you’re a woman, have your hormones checked as well as insufficient thyroid hormones, low progesterone or low progesterone in relation to estrogen can also cause symptoms of anxiety. Obviously I am not a doctor, so check with yours before you delve into these supplements. I know this always freaks people out but since caffeine is a stimulant, it only serves to up the ante when you’re already panicked. Wean off if you must, but I definitely recommend cutting down on it at least temporarily because jittery on top of anxious is just bad news. Exercise is one of the best natural anxiety remedies, even if it’s gentle stretching. I am not a fan of exercise, but I did find that brisk walks in the evening with my husband and dog helped me to clear my head and relax a bit. I was initially afraid to raise my heart rate because I was convinced I was dying of a heart attack, but as I walked (and didn’t die of a heart attack) I realized that I was worrying for nothing, and the activity felt good. Yoga helps too because it stretches the muscles gently and oxygenates the blood. Both are helpful since anxiety often causes tension. I haven’t personally tried diffusing oils (some people swear by them) but I use them in other capacities such as in a carpet sprinkle, dabbing on my wrists or in bath water. Essential oils are quickly becoming people’s favorite natural anxiety remedies. Look into which oils are best for calming (or just choose your favorite scent) and go from there. You don’t necessarily have to buy the expensive “direct marketing” brands, Amazon and your local drug store may have just what you need. Even if you’re not a bath person, trust me on this. Invest in some epsom salts or dead sea salt, and the previously mentioned essential oils for a soothing experience. I like to bring a book in there or soft music, but sometimes just being alone with your thoughts and letting them flow with the water is good too. When things got really bad, I would lay back with only my nose and mouth above the water and just revel in the silence. Some people like to run the shower over them while they sit in the tub and get lost in the spray. Either way works. This one has helped me immensely. Instead of taking short, panicked breaths, slow your breathing by inhaling and exhaling deeply through your belly. This brings about an instant feeling of calm when things get rough. It can be done anywhere-in the car, on a plane, in the tub, at work…wherever you’re feeling stressed. This might be tough for some (myself included) but when my anxiety was at its worst, I found that social media was too much of an onslaught of negativity. Reading news headlines, unabashed opinions and personal attacks proved to be too overwhelming. Sign offline or find something more soothing on the internet. I find if I have to keep my mind busy, Pinterest is a much more soothing option than say Facebook or Twitter. There’s no newsfeed on Pinterest so you have some control over what you see. Find the humor section and check out pics of cute kittens to keep yourself busy. Advice on this topic varies, but I find a couple things that work for me are either telling myself there’s nothing to worry about (and listing logical reasons) or just allowing the panic to wash over me. If I go with the first option, I say things like “You had 3 EKGs and a chest x-ray, you know you’re not having a heart attack, its just the anxiety again. This feeling will pass.” In both scenarios, telling yourself “you have felt this way before and survived, you will survive this too. You are strong!” can often help. These little gems are my secret weapon. 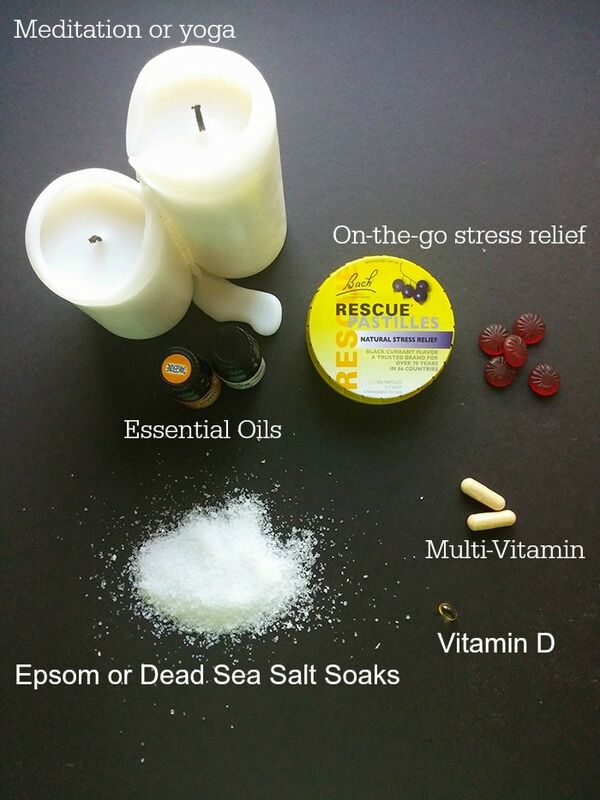 RESCUE products are all natural anxiety remedies made from plants and flowers. They come in a couple different varieties. 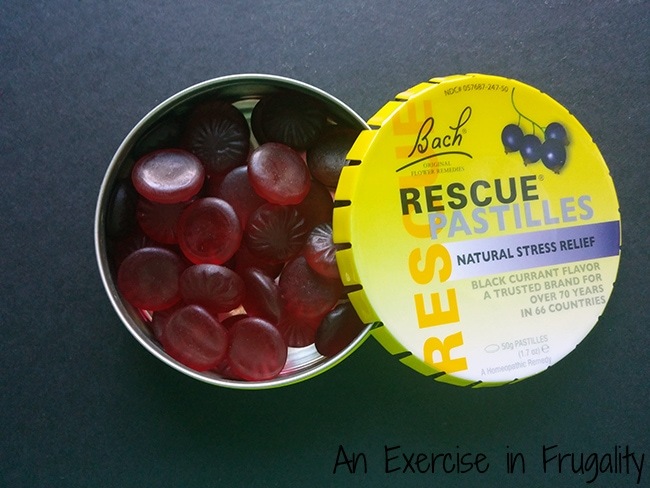 I like the Pastilles because they come in a small tin that I can keep in my purse in case I experience any episodes of stress or anxiety on the go. There’s even a coupon for RESCUE products so you can save a little cash when you’re trying out the RESCUE line of products. They are sold at Walgreens, CVS and Whole Foods. Look for them in the sleep section (even though they aren’t really a sleep aid, you can take them any time of day!) I love that they are safe and non-habit forming, and were developed by a doctor. Perfect for staying in control of your stress and anxiety on the go. If your stress or anxiety is overwhelming on a regular basis, please seek professional help. Too many people place a stigma upon mental health when really its like any other physical health condition. Consult your medical doctor or seek a therapist to help you through. I had countless medical doctor appointments, as well as weekly visits with a “talk-therapist” or counselor who I still see weekly. It has helped immensely and I highly recommend it. After the first visit I actually felt lighter when I left her office! I thought I would dread the appointments but I genuinely look forward to them each week. 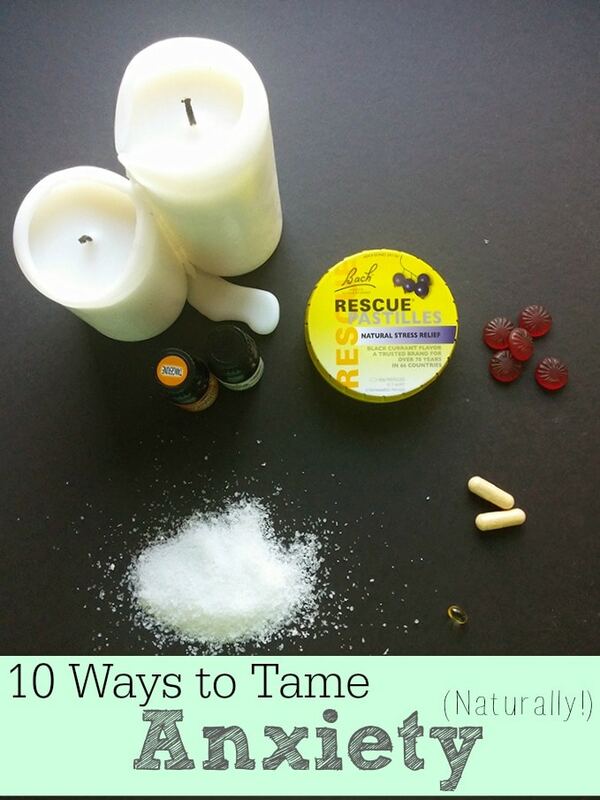 Do you have other natural anxiety remedies you use? Thanks for your suggestions Tara Jean! Guided is the only way that works for me! I have ADHD and my brain wanders way too much to focus on relaxing. 🙂 Thanks for your recommendations and your kind words. Thankfully I’m doing better now, though I still deal with the occasional panic attack and anxiety but I have it much better controlled!